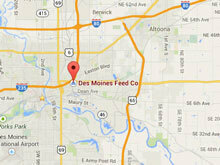 Des Moines Feed Company was known for selling coal, grains, hay, straw, and Larro Feeds (a division of General Mills). John W. Holt bought the business in March 1944 during World War II. Hubert, one of his sons, started working there after school and became full time in 1947. We invested in a hammer mill and a new feed mixer. In the mid-50s, we bought a bulk feed truck and, a year or two later, two mobile grinder-mixers for on-the-farm feed grinding. 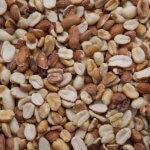 For in-town folks, we started mixing Wild Bird Feed; also Pigeon Feed for the hobby pigeon fanciers. During the 60s, we became a dealer for: Kent, Purina, and Wayne Feeds. 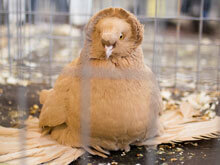 We broadened our lines of Wild Bird Feed and Pigeon Feed to include Cage Bird Feeds. With growth in mind, we installed equipment to crack our own corn, and a cleaner for grain. Stanley, Hubert's son, who had been working part time, came on full time. In 1975, John W. Holt retired, leaving the business in the hands of two sons and four grandchildren. To support our wholesale growth we expanded our Wild Bird Feed line and introduced "The Des Moines Audubon Brand Wild Bird Feed." The oil-rich and nutritious formulations attracted more varieties of song birds much to the delight of bird watchers. We expanded our warehouse storage and production line-adding more equipment. We put more emphasis on the energy in our pigeon mixes and thus grew our line of Des Moines Pigeon Feed. A new retail building was built and on January 1, 1993, we divided the original business into two separate businesses: (1) retail and garden center, and (2) our manufacturing and wholesale. Ron, Stanley's son, came on full time in 1993. We increased our grain cleaning and bulk storage in 1998, to further our commitment to clean grains and mixes. Customers called upon us to manufacture their custom mixes and there began to be more interest in drug-free and all-natural feeds. While we have not gotten into organic feeds, some of our ingredients are OMRI certified and are used in our all-natural poultry and livestock feeds. Hubert Holt retired in 2006, leaving the business in the hands of his son and grandchildren. Mainly due to droughts, our sales territory continues to expand due to customer demands. Our attention is focused on not only quality mixes but, equally important, high quality and nutritious grains that make up the mixes. We assure you we add no chemicals, drugs, or artificial flavors to our products—it's just wholesome feed, naturally.